Annual ETA Open House and Customer Appreciation Day. 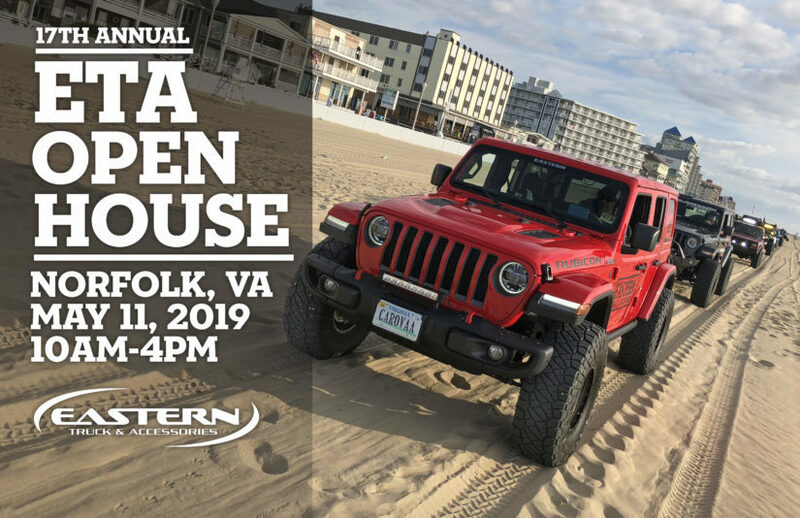 Come out and join the Eastern Truck & Accessories team at the shop in Norfolk, VA from 10am-4pm for a fun filled day. This event will be held rain or shine and is always fun for the whole family with activities for 4×4 enthusiasts of all ages. Building on the success of past year’s we’ll be raising money for a worthwhile cause, the Cystic Fibrosis Foundation with the goal to outdo last year’s record breaking fundraiser where we brought in $50,000 to donate for CF research. If you’ve got a show worthy 4×4, lowered truck or muddy Jeep be sure to enter it in the show-n-shine contest for one of the many categories being judged. There will be several vendors on site to answer questions and give demos. Tour the ETA shop and get an up-close look at all the ETA project builds. Buy a t-shirt and enter to win some of the gear being raffled off throughout the day. Around noon the crew will be serving up lunch which will lead into the always entertaining live auction. As with past years we’ll be raffling/auctioning off an array of prizes from lift kits, tires, wheels, install labor, bumpers, lights, TVs, tools, truck accessories and more valued at well over $30,000. Main Event – Event will be held Saturday May 19th, 2018 from 10am-4pm at the ETA Shop, 6230 E. Virginia Beach Blvd, Norfolk, VA 23502. Free general admission for everyone. Parking – Truck Show takes up front and rear parking lots. General parking is next door (just West of the shop) behind the building. Truck Show – $20 entry fee p/ vehicle. Starts at 10am, must arrive by 11:30am to be included in judging. Awards will be handed out between 3-4pm. Categories include Best in Show, ETA Staff Choice, People’s Choice, Tallest in Show, Lowest in Show, All Show No Go, Best Paint, Muddiest in Show, Best Jeep, Most Ground Clearance, Best 2WD, Most Accessorized, etc. Lunch – a free lunch will be served at 12pm for all attendees. We’ll be grilling hamburgers and hotdogs, along with chips and sides to fill up on. Water and soft drinks will be provided as well.